Davis, Paul K.: Uncertainty Sensitivity Planning; in: Johnson, Stuart; Libicki, Martin; Treverton, Gregory F. (Eds. ): New Challenges – New Tools for Defense Decision Making, 2003, pp. 131-155; ISBN 0-8330-3289-5.
Who is better than planning for very complex environments than the military? On projects we set-up war rooms, we draw mind maps which look like tactical attack plans, and sometimes we use a very militaristic language. So what’s more obvious than a short Internet search on planning and military. 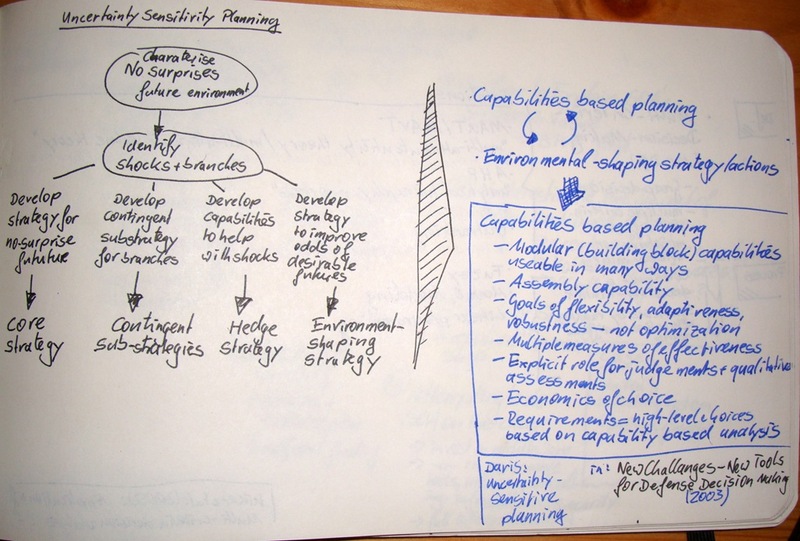 Uncertainty Sensitivity Planning combines capabilities based planning with environmental shaping strategy and actions. Capabilities based planning plans along modular capabilities, i.e., building blocks which are usable in many different ways. On top of that an assembly capability to combine the building blocks needs to be planned for. The goal of planning is to create flexibility, adaptiveness, and robustness – it is not optimisation. Thus multiple measurements of effectiveness exist. During planning there needs to be an explicit role for judgements and qualitative assessments. Economics of choice are explicitly accounted for. Lastly, planning requirements are reflected in high-level choices, which are based on capability based analysis. 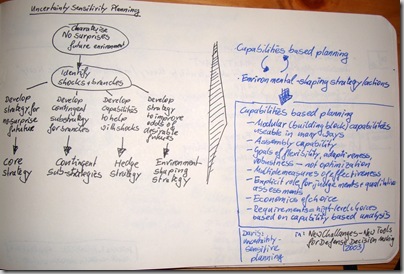 This entry was posted on Donnerstag, Januar 8th, 2009 at 20:40 and is filed under Complexity, Decision Making, Planning. You can follow any responses to this entry through the RSS 2.0 feed. You can leave a response, or trackback from your own site.